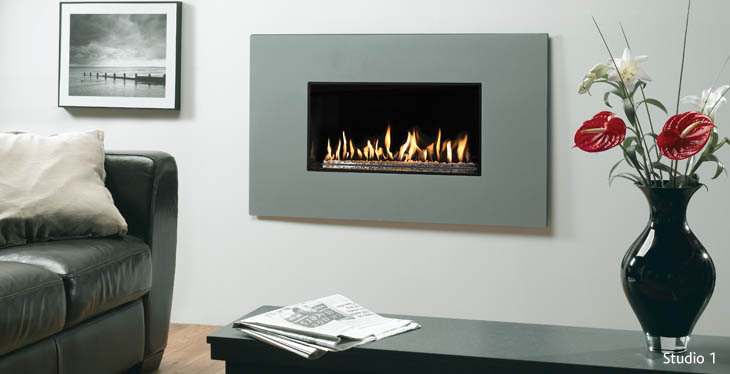 The Studio Steel 2 gas fire is for those with larger spaces who wish to create an even greater presence with their choice of fireplace. The Studio Steel 2’s wide frame instantly creates a distinctive and individual focal point that can be further heightened by your choice of frame colour. Furthermore, why not create a whole new look by taking advantage of the vermiculite or black reeded linings for log-effect Studios or upgrading a white stone fuel effect to one of three coloured glass beads. Operation is simplicity itself, as Gazco’s remote control takes care of everything from ignition to flame height adjustment. Finishes: Graphite, Iridium, Metallic Red, Metallic Blue, Metallic Bronze and Ivory. Linings: Black Steel (Open Fronted Standard), Polished Granite (Open Fronted Upgrade), Black Enamel (Glass Fronted – White Stones or Glass Beads), Black Reeded (Glass Fronted – Logs) and Vermiculite (Glass Fronted – Logs).